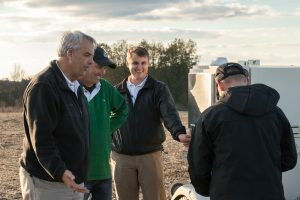 While attending the recent InfoAg Conference and Trade Show in late July in St. Louis, I had an opportunity to introduce the Falcon Automated Soil Sampling System during a pre-conference tour. I also spoke on the conference program about the profitability of various precision agriculture practices on our North Carolina farm. One thing is clear as I talked with conference attendees: there is growing awareness that high-quality soil samples are absolutely critical to a well-grounded variable-rate fertility program. That’s where I know the Falcon system can contribute to improved productivity and adoption of science-based precision agriculture practices. The above is a video of an interview I did with Paul Schrimpf of the CropLife Media Group at InfoAg.